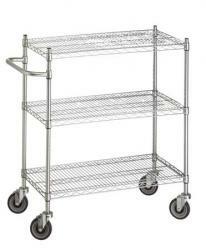 3-SHELF WIRE UTILITY CARTS ARE NSF APPROVED. These bright, shiny, chrome-plated all purpose 42� high (with casters) carts are a flexible as they are practical. Each unit is equipped wit 3 sturdy wire shelves and includes an adjustable 10� handle. All sizes are equipped with 5� casters (two locking). All shelves adjust in 1� increments to adjust for load changes. Units are available with a solid top or bottom shelf option.